With autumn in the air I start thinking about pies. My family, not usually big pie eaters, enjoy fruit pies as a seasonal right of passage. 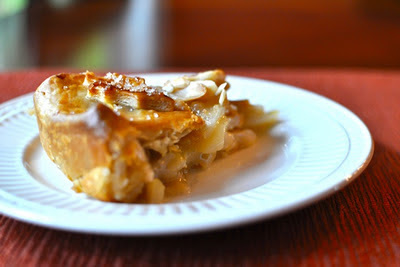 Apple Pie is the most requested. I also like to make Peach Pie and Pear Pie. As the seasons of my life change, however, I find there are hardly enough folks around my table these days to eat a normal sized pie, especially one made in today's most available pie dish, what seems to me an oversized 9½-inch deep dish pyrex pie plate. Normally I would use an 8-inch pie dish. I stocked up on those a while back. Still, with just two or three around the table, I am finding even that is larger than I would like. I have been wanting a set of 6-inch pyrex tart pans with a fluted edge. They don't make these anymore but you can occasionally find them on ebay. Unfortunately I’m not so good at the ebay auction process. I "watch" a set from time to time but ultimately forget to check when the auction is ending and am outbid. Meanwhile I keep making “little pies” in my 8-inch pie plates. Instead of lining the dish with one crust and topping with another I lay the bottom crust loosely in the pan, put in however much filling seems right for the number I expect for dinner, and then fold the bottom crust over the filling topping the exposed center with a little streusel topping or a few cutouts from leftover bits of dough. 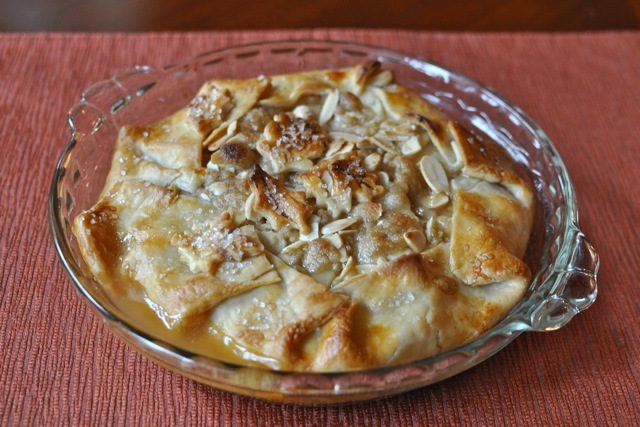 This particular recipe provides for a moderate slice of pie for 4 to 6 people. It’s usually just enough to share with my children or another couple while fresh from the oven and still warm. Fit the pastry into an 8-inch pie dish leaving an unfinished edge of 1 to 1½ inches of dough at the rim. Brush the bottom center of the pie crust with a little egg white. Set aside. Make the streusel topping: Place 1 Tablespoon each of flour, brown sugar, toasted almond pieces and butter in a small bowl. Mash together with a fork or fingers until crumbly. Place in refrigerator until ready to use. Make the pie filling: Toss pear slices with the lemon juice. In a small bowl combine the brown sugar, salt, flour, ground ginger and candied ginger. Sprinkle the mixture over the sliced pears and stir to combine. Assemble the pie: Pour the pear mixture into the prepared crust. Fold the unfinished edge loosely over the filling. Brush the crust edge with a little egg white and sprinkle with coarse sugar, if desired. Sprinkle the streusel evenly over the exposed pie filling. Decorate with small cutouts from any leftover scraps of dough, if desired. Bake in a preheated oven at 425 degrees for approximately 30 minutes or until the crust is golden brown. Love-love the informality of the crust, very cool idea, Lis. I've been after small pie pans too, let's make a pact, whoever finds them first, buys four, two for you, two for me. :-) One each for the freezer. I was looking at this, wishing I could make it, when suddenly I realized that I have pears in my fridge and ginger in a basket in my kitchen. One ginger pear pie, coming up. it's not a baby pie, it's not a full-grown pie, so it must be a teenaged pie. lovely. i like the rustic-edged crust a lot! Danielle - I hope it was good! I've enjoyed this pie several times over the past few weeks. The ginger and pear make a memorable combination. Grace - Teenaged! Absolutely. I love it!